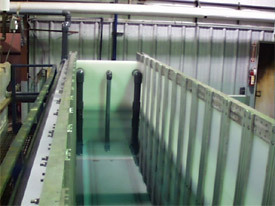 Anodize USA will design and fabricate a complete cathode bussing system for your new or existing anodizing tank. It is designed based on tank size, work load and rectifier capacity. Your system comes ready to assemble. Fasteners are not included. These systems are custom designed to your operating parameters and can be fabricated and shipped in 2-3 weeks. Anode bar setups are also available. Call for pricing. Controversy in the industry has continued over the issue of bolting V/S welding of the cathodes in today’s anodizing operations. Let me dispel the myth that bolting does not work. This is myth has been proven incorrect by numerous Anodize USA customers over the past 7 years. Now here are some of the facts about welding cathodes or any metal. Remember contact area is the important factor. When welding two plates of metal of any material the edge down to 1/4" - 1/2" is the only area which makes guaranteed contact. The areas beyond the weld, specifically in the case of welding a plate of 4”x4”, will expand and bow outward, creating a void and thusly stopping contact between the two surfaces that are welded. In addition by welding, heat is built up in the aluminum and changes the heat designation –T6 of the aluminum to an unknown or dead soft material. This can cause the aluminum to be susceptible to attack from the sulfuric acid in the bath. Now let’s discuss bolting. The bad reputation bolting has gotten is from less than well thought out bolting installations. Remember we are looking for good and consistent contact. The contact comes from clean and adequate contact area. Running 2000 amps through an area that is 1x1” held together with 1 bolt will only cause localized heating and the formation of oxide that will further reduce contact area. That is why we at Anodize USA have a bolt pattern that is designed to spread and keep contact area at a maximum. We also recommend a good electrical contact sealant to protect this contact area. One more thing, using bolts and other hardware that is other than 316 stainless will only lead to more troubles. Our systems design and units have been in service over 7 years without any problems associated with our bolting system.